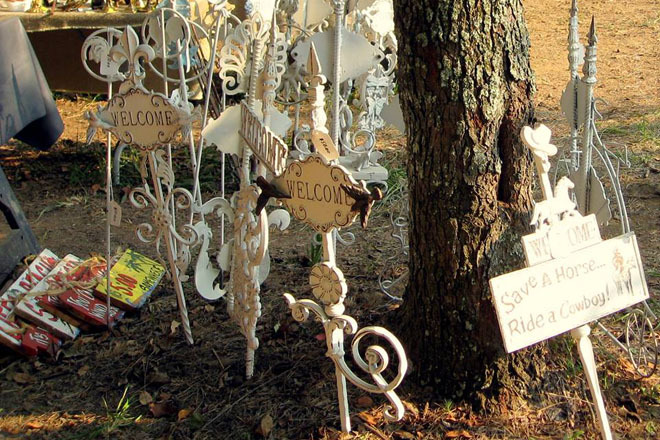 The World’s Longest Yard Sale is America’s “most scenic shopping mall” and stretches 660+ miles through 6 states! The World’s Longest Yard Sale starts each year on the the first Thursday in August and continues for 4 days (Thursday thru Sunday.) The event allows you to travel more than 690-miles of scenic beauty and see tons of yard sales. 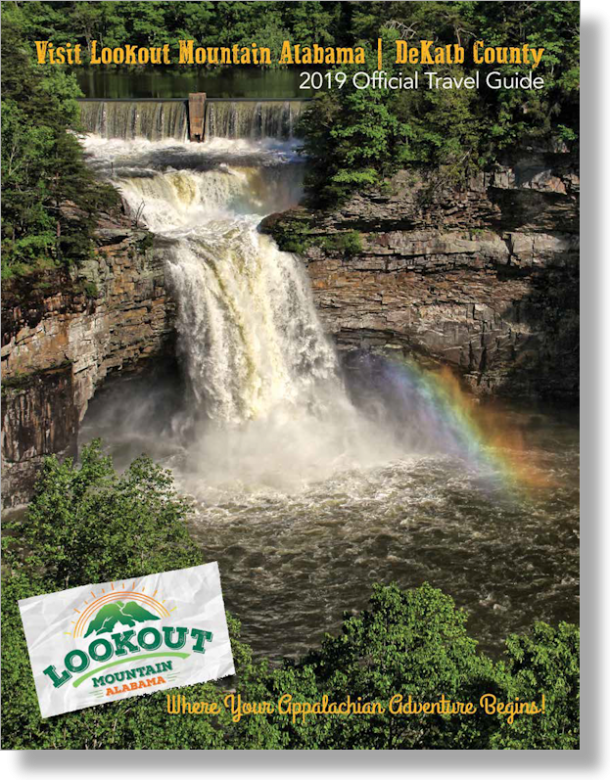 Get started on your journey by traveling the 93-mile Lookout Mountain Parkway route from Gadsden, Alabama to Chattanooga, Tennessee for the most “scenic rural America” in the United States. Alabama has more than 1,000 yard sale vendors alone! 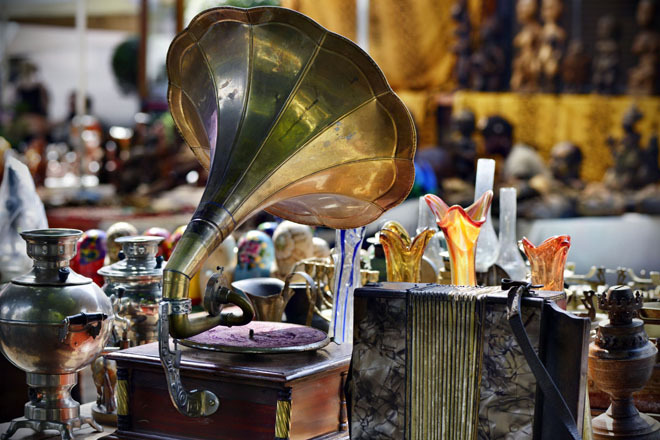 You will find everything from antiques, collectibles, furniture, dishwares, fresh garden produce, homemade jams and jellies, food vendors, live entertainment and so much more. Continue with the World’s Longest Yard Sale, following the U.S. 127 Corridor from Chattanooga, TN to Addison, MI for another 590 miles of yard sale bargains. 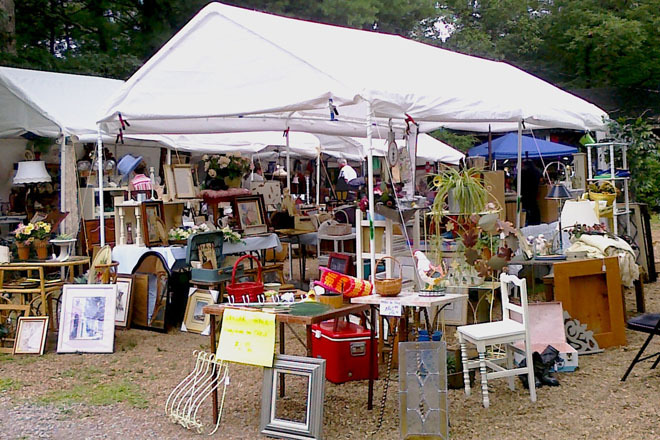 When combined, the Lookout Mountain Parkway and the 127 Corridor have had as many as 5,000 vendors lined along the scenic yard sale route on Lookout Mountain in Alabama and each year promises to be even bigger than the last! Residents of DeKalb County, Alabama invite you to spend some time touring the area and enjoying our local hospitality. Spend the night in one of our many bed & breakfast inns, cabins, hotels & motels, and unique accommodations located within minutes of the yard sale route. View scenic vistas and majestic waterfalls as you visit the Little River Canyon National Preserve and DeSoto State Park. See deer and cattle grazing side by side in rolling hills and farmland. 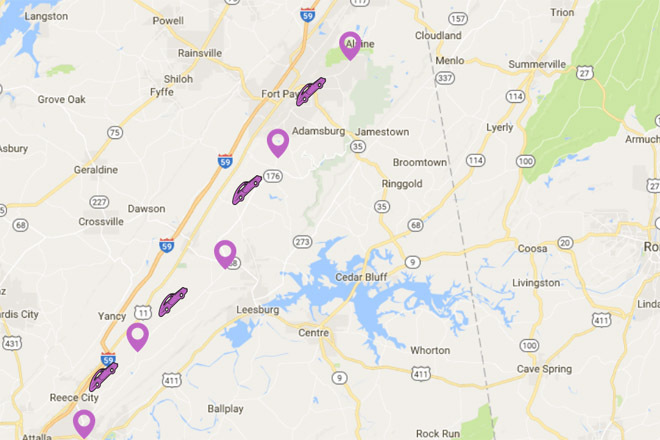 Come travel the Lookout Mountain Parkway in DeKalb County, Alabama! 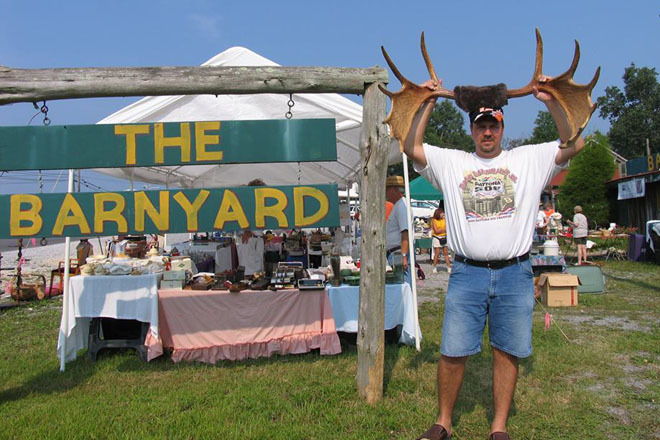 The concept of the World’s Longest Yard Sale in August is to pull people off the interstates and back into the heartland of rural, scenic America. The event encourages businesses and residents to participate by having yard sales, sidewalk sales and special promotions for a continuous stretch from one end of the sale route to the other. Once established, the end result is lots of fun for vendors and shoppers alike. We have all heard the saying “One man’s junk is another man’s treasure.” That adage holds true as this event brings people together from all across the country and from around the world to barter and haggle over things that may have been stored in a garage or an attic somewhere for years. The pleasure we derive from rummaging through someone’s junk, hoping to find something unique and maybe even to stumble across an item worth a lot to you but the seller says, “I’ll take .50 cents for that.” What joy! Oh, and you get to meet some pretty neat people by the way. We hope you take the time to travel the yard sale route. You will be glad you did. Discover the wonders YOUR America has to offer. The yard sale brings about various questions from people that are new to the event. Hopefully these answers will help to give people a better understanding of the events. Anyone can be a vendor by simply having a yard sale in their yard, at their business or setting up in designated vendor places. Many communities have different places were vendors from within and outside of that town or city can set up a booth. The main thing is to be sure you have permission from the land owner to set up a booth. Usually the more the merrier therefore clusters of vendors are commonly found along the route. Almost anything! Popular is junk, antiques, collectibles, dishes and glassware, to farm implements, food items, produce and more. Some things to consider however are business licenses and health department permits. Each town has different rules and regulations so be sure to check with the local City Hall and Health Department where you set up your booth for any licenses or permits you may need to purchase. Yard sales can be found along the route at homes located on the designated route, in business parking lots, along side streets adjacent to the route, in wide open fields and pastures (remember, these roads pass through beautiful rural areas with farms and some of the most awesome scenery you will find anywhere), and basically anywhere people can find to set up. Some areas will have large numbers of vendors in one group, others may be scattered and in some instances you may travel for several miles or more without seeing a yard sale because of the distances between homes on the country roads. Where does it BEGIN and where do I PARK? The current length of the World’s Longest Yard Sale takes you from Gadsden, AL to Hudson, MI. You might decide to start at the southern end and travel north or right the opposite. You may decide to jump on board anywhere in between. Parking may be limited in some areas to virtually impossible in other places to ample. It depends on the area. The yard sale routes become narrow country roads in many places but don’t let that discourage you. VERY IMPORTANT – be cautious of the driver in front of you and pedestrians on the roadway – be patient and a parking space will present itself. What TIME do the SALES BEGIN? Each vendor is on their own and can choose when they want to begin but typically vendors are active by 8:00 a.m. and operate until late in the evening. Definitely! You found something you just had to have but don’t have room to load in your vehicle? Many communities have shipping centers and of course Post Offices. They will be glad to work with you to get your items home so you can continue on the yard sale route. The event was created by tourism officials in Tennessee, but rely on community support from each town and/or county tourism and chamber office to promote the event in their regions. The success of the sales depend on coordination from each community. There is no fee to participate however some vendor spaces may charge a nominal rental fee to allow you to set up a booth. No, you should never have to pay admission. The event was not set up for that purpose. That depends on how disciplined you are and how much ground you want to travel in one day. If you have to stop at every yard sale then it may take you awhile. It is easy enough to “cruise” the yard sales and travel a modest distance but it also easy to get caught up in the event and spend 3 to 4 hours in one area. Pre-Plan. Decide in advance how much time you want to spend in each area and try to stick with your plan. But most of all – have a good time and enjoy the sights and sounds. Are there HOTELS near the yard sales and should I make RESERVATIONS? Yes, there are plenty of accommodations located along the way. Making reservations is a wise decision but you have to have a plan and be disciplined to make your destination for the night. Getting a room may be difficult if you wait too late in the day to find a place but not impossible. Drive a large car. You never know what oversize treasures you might unexpectedly find. Bring items such as sunscreen, sunglasses, a hat, and mosquito repellant, to protect yourself from the elements. It’s hot and humid in this part of the country and the sun can roast you even on a cloudy day. Wear comfortable shoes and drink plenty of fluids, chances are you’ll be doing a lot of walking. It is usually very warm and all the walking and activities can drain you before you know it. Don’t succumb to a heat stroke or dehydration. Many vendors don’t take credit cards or checks, so bring cash. Get out there early! Though there are hundreds of vendors who sell all day long from sunup to past sundown, you’ll be competing with thousands of other shoppers. And as with any yard sale, the good stuff goes quickly. Be very cautious of other vehicles. You will often find your self looking off on the sides of the road at the yard sales and before you know it the vehicle in front of you has come to a stop. Be alert. Watch for pedestrians. Take pictures. Enjoy YOUR America! Visit the World’s Largest Yard Sale / Official 127 Corridor Sale online for more information, resources, and details.